2014-11-28 23:00 WEATHER ACTUAL. 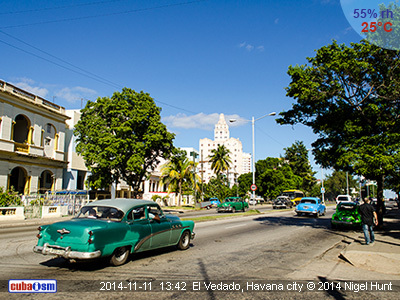 HAVANA CITY. Cloudy with a few short-term, light showers. Low of 24C. 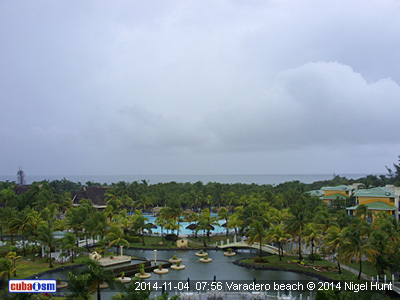 2014-11-28 17:00 WEATHER ACTUAL. 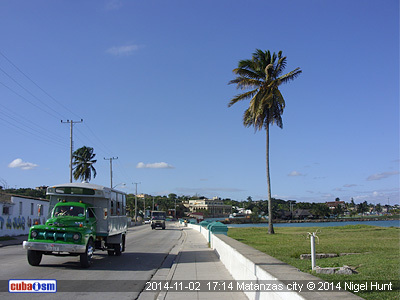 MATANZAS CITY. Sunny spells with light rain in the late afternoon. Warm (27C) and breezy with some unrest of the sea. 2014-11-30 03:00 WEATHER FORECAST. NATIONWIDE. 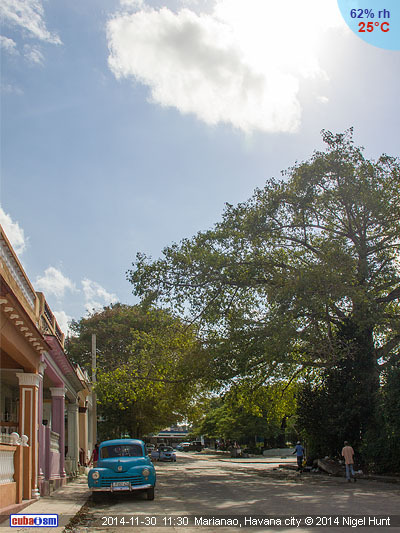 The presence of a continental high pressure will favour the dry weather across western and central Cuba with plenty of sunshine and just a few clouds around. 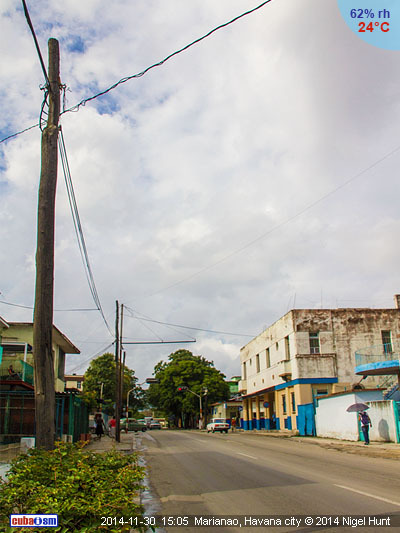 In the East, however, the clouds and rain will continue to be present due to the remnants of a cold front extended over the Windward Passage and the Hispaniola. Daytime temperature will be between 24-27C (75-81F), somewhat warmer in the East. Overnight, the lows will be in the range of 20-23C (68-73F). North-eastern winds will reach top speed of 40kmph (25mph) and will cause rough seas in the whole archipelago, especially in the North where the waves will represent and annoyance for water activities. 2014-11-29 20:00 WEATHER ACTUAL. 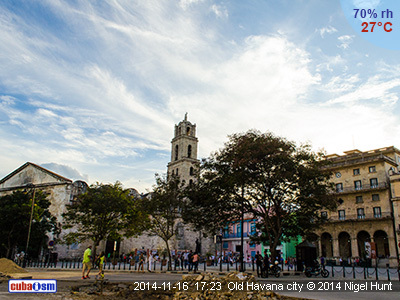 HAVANA CITY. Partly cloudy and cool (Feels like 19C). NE winds at 15kmph. 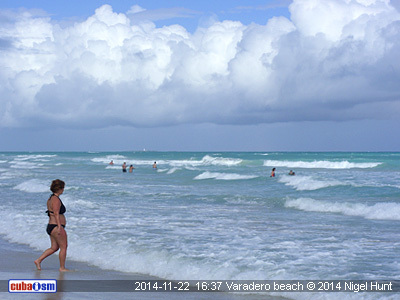 2014-11-29 17:00 WEATHER ACTUAL. 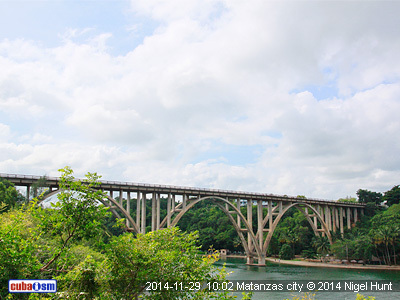 MATANZAS CITY. Sunny and breezy all day with a high of 24C. Rough sea. 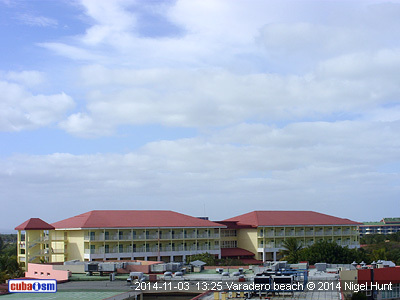 2014-11-29 12:00 WEATHER ACTUAL. 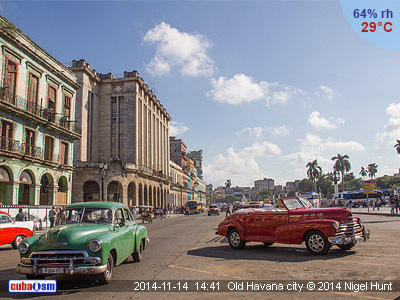 HAVANA CITY. Mostly sunny and fine with a high of 23C. Moderately strong winds. 2014-11-29 03:00 WEATHER FORECAST. NATIONWIDE. 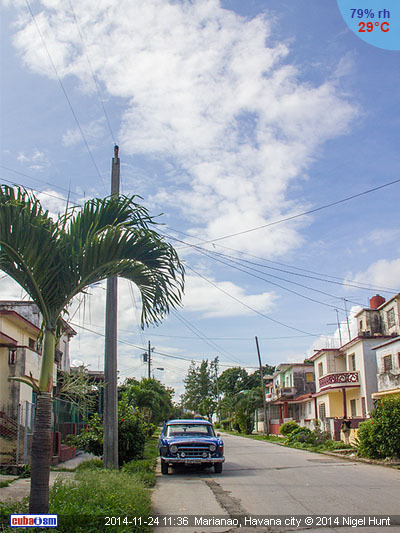 Forecasters predict a dry day throughout Cuba with lengthy sunny spells apart from the Eastern region where the overcast skies and rain will be the story. 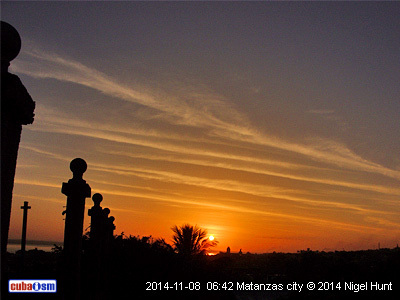 Maximum temperature will range from 24-27C (75-81F), dropping to 19-22C (66-72F) at night. 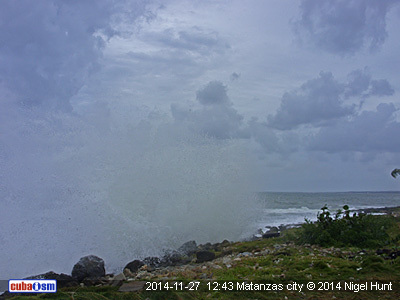 The rough sea will persist across the north coast due to the force of the north-easterly winds. In the south, however, the sea will remain quiet. Partly cloudy and cool. Moderate winds. Clear skies and plenty of sunshine throughout the day with comfortable temperature (23C). 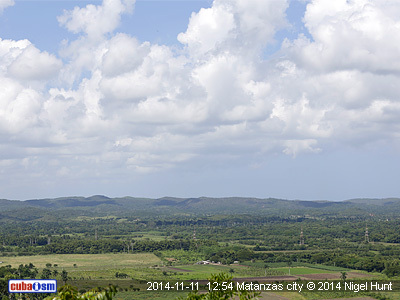 2014-11-28 12:00 WEATHER ACTUAL. 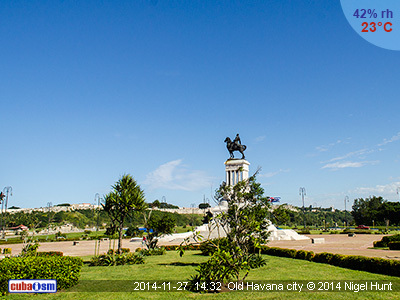 HAVANA CITY. Clear blue skies and sunny with a high of 22C. 2014-11-28 03:00 WEATHER FORECAST. NATIONWIDE. 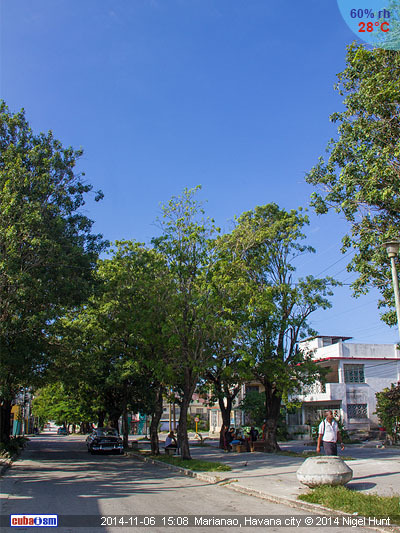 It will be a delightful day across western and central Cuba with bright sunny skies and highs in the range of 21-24C (70-75F). Overcast skies and some rain are expected in the East due to the remnants of a cold front extended over this region. Tonight's temperature will be between 15-18C (59-64F). Fairly strong winds will produce tidal waves across the North with coastal flooding in low lying areas of the West. There will be waves in the South too. 2014-11-27 23:00 WEATHER ACTUAL. 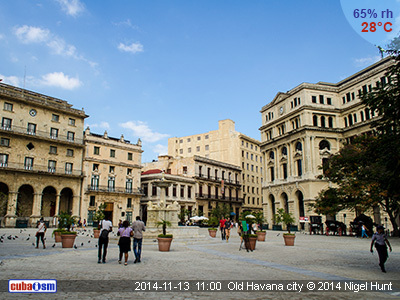 HAVANA CITY. Mostly clear and fine with a low of 22C. Gusty winds. 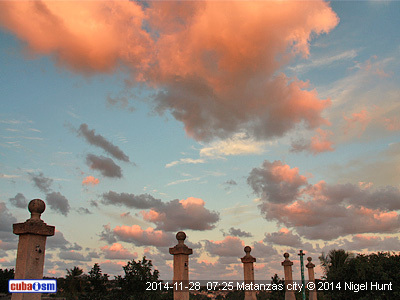 2014-11-27 17:00 WEATHER ACTUAL. 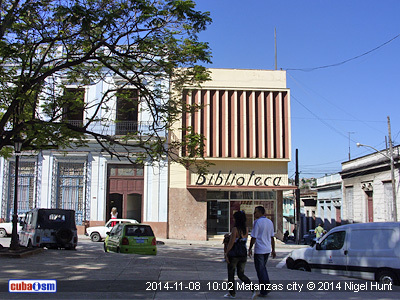 MATANZAS CITY. 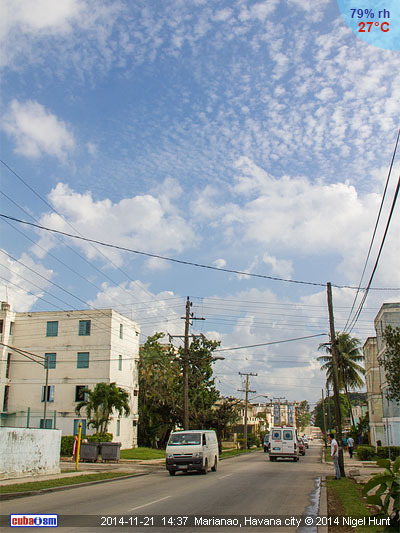 Mostly cloudy all day with a temperature around 25C. Moderate winds and rough sea. 2014-11-27 12:00 WEATHER ACTUAL. 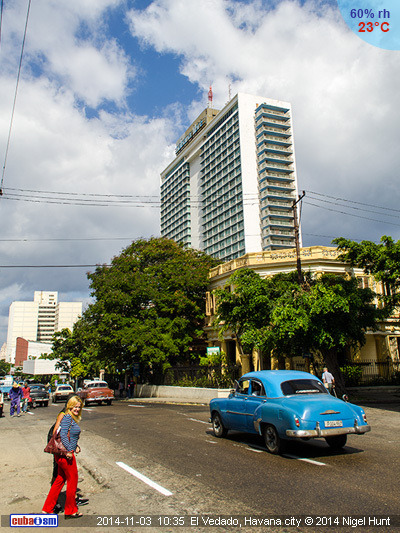 HAVANA CITY. Sunny and dry with a high of 23C. Winds from the north at 26kmph. 2014-11-27 03:00 WEATHER FORECAST. NATIONWIDE. 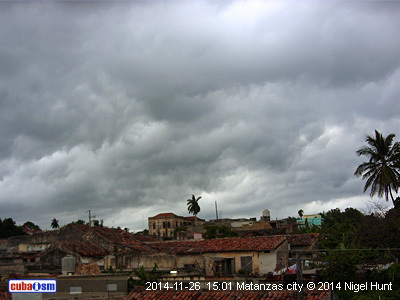 A band of clouds associated with a cold front will bring overcast weather conditions over most of Cuba with some showers and rain. Temperature will be between 22-25C (72-77F) across western and central provinces while in the rest of the country it will remain in the top 20's C (70's F). Overnight, the minimum will be in the range of 17-20 C (63-68 F). Northerly winds will blow over western and central regions with speeds up to 40kmph (25mph) and higher gusts. In the east, however, they will be generally light. There will be waves throughout the north coast producing coastal sea flooding in low-lying areas of the western part. All along the South coast there will be calm sea. 2014-11-26 23:00 WEATHER ACTUAL. HAVANA CITY. Cool evening (21C) with cloudy skies. Gusty northerly winds. 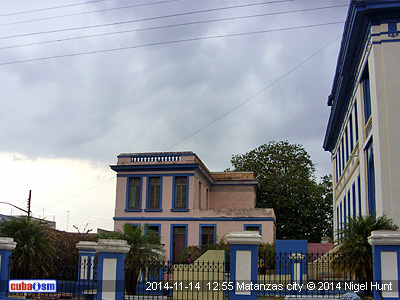 2014-11-26 17:00 WEATHER ACTUAL. 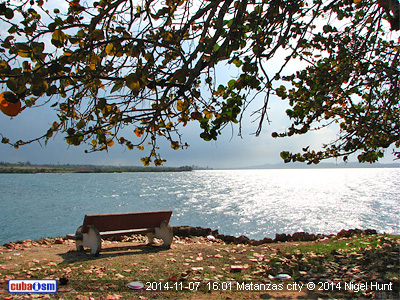 MATANZAS CITY. Nice start with clear blue skies and sunny. A gathering of clouds brings some afternoon showers. 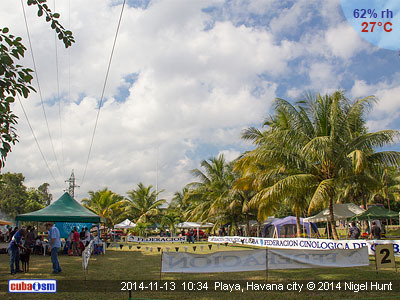 2014-11-26 11:00 WEATHER ACTUAL. 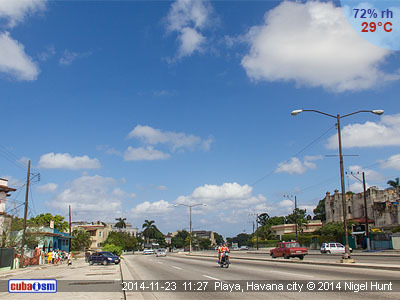 HAVANA CITY. Cloudy with spells of heavy rain. 2014-11-26 03:00 WEATHER FORECAST. NATIONWIDE. 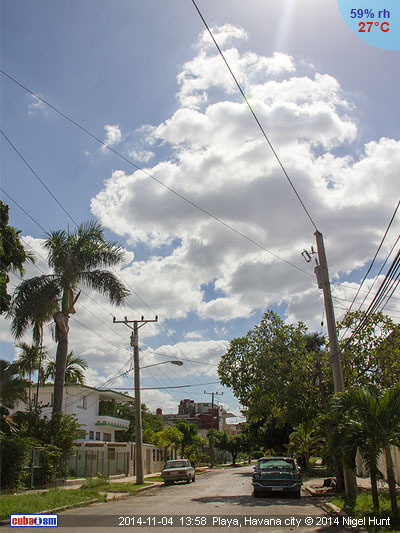 This Wednesday will start fine with abundant sunshine across Cuba except for the western region where the arrival of a new cold front will bring a fairly cloudy day accompanied by some rain. This situation will spread into the Central region during the afternoon. Maximum temperature will be between 30-33C (86-91F), less hot in the West. Overnight, the lows will be in the range of 21-24C (70-75F). The force of the winds will cause tidal waves in the North, even with slight coastal flooding in low lying areas of the West. Expect calm sea in the South. 2014-11-25 23:00 WEATHER ACTUAL. 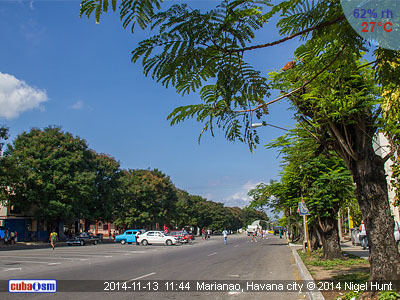 HAVANA CITY. Warm evening with mostly clear skies and a low of 27C. 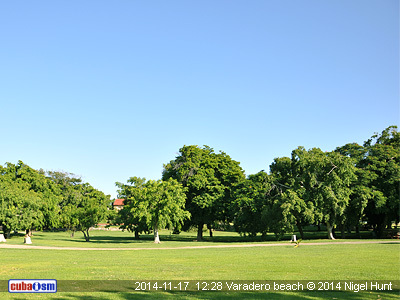 2014-11-25 17:00 WEATHER ACTUAL. 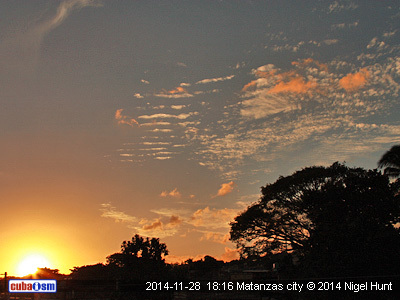 MATANZAS CITY. 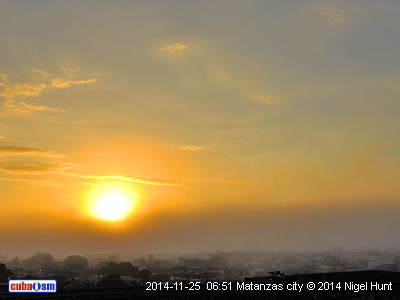 Dawn with dense fog over the city. Mostly sunny and warm all day long. 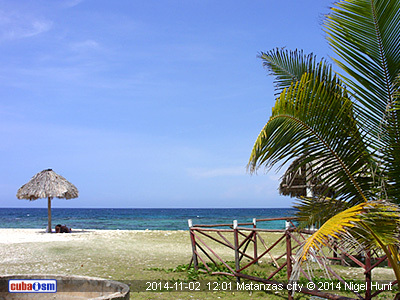 2014-11-25 12:00 WEATHER ACTUAL. 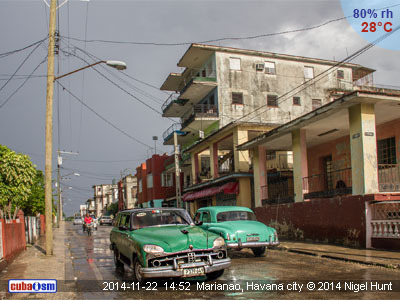 HAVANA CITY. Very warm (Feels like 34C) with plenty of sunshine. Light to moderate winds. 2014-11-25 03:00 WEATHER FORECAST. NATIONWIDE. Today's weather will start fine with lengthy sunny spells and a few showers only over the westernmost area. Expect a humid and warm day with highs between 30-33C (86-91F) while the temperatures at night will be in the range of 24-27C (75-81F). The winds will be light but will gather strength at times in the West. 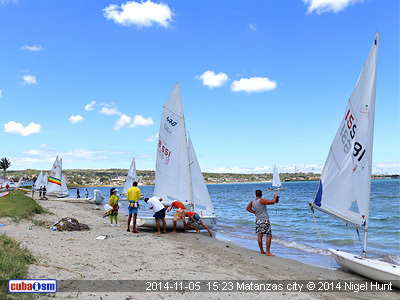 Rough sea is expected in the North-east, the same goes for the southern strip between Punta de Maisi and Cabo Cruz. There'll be calm sea in the rest of the south coast. 2014-11-24 23:00 WEATHER ACTUAL. 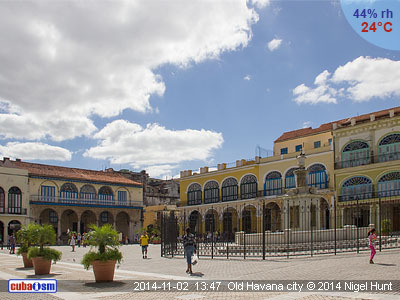 HAVANA CITY. Warm evening (27C) under mostly clear skies. Weak winds. 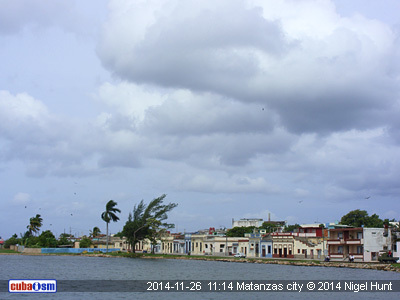 2014-11-24 17:00 WEATHER ACTUAL. 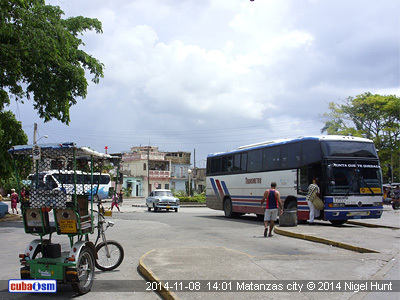 MATANZAS CITY. Sunny spells all day with occasional rain in the midday. High of 30C an light winds. 2014-11-24 12:00 WEATHER ACTUAL. 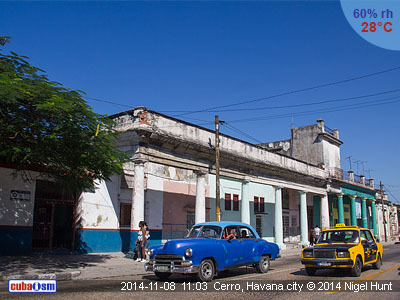 HAVANA CITY. Sunny spells with a light and short-term rain. High of 29C. 2014-11-24 03:00 WEATHER FORECAST. NATIONWIDE. 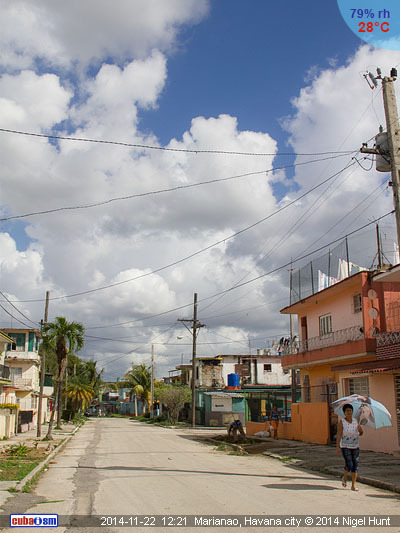 Forecasters predict a dry day in Cuba with long sunny spells although there's a chance of afternoon showers and thunderstorms in the western area. Maximum temperature will range from 30-33C (86-91F), dropping to 23-26C (66-72F) overnight. The sea will be mostly calm across the archipelago apart from the North-east area where the waves could be an annoyance for water activities. The winds will be weak all day long. 2014-11-23 21:00 WEATHER ACTUAL. 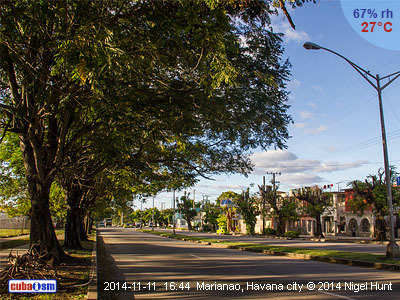 HAVANA CITY. Damp and mostly clear. Temperatures around 26C. 2014-11-23 17:00 WEATHER ACTUAL. 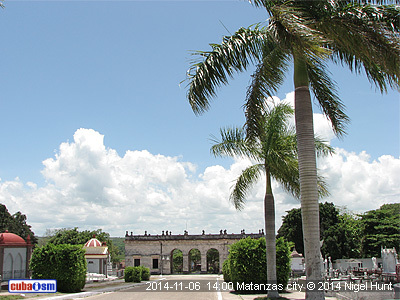 MATANZAS CITY. Long sunny spells all day with warm temperatures (29C) and light winds. 2014-11-23 12:00 WEATHER ACTUAL. 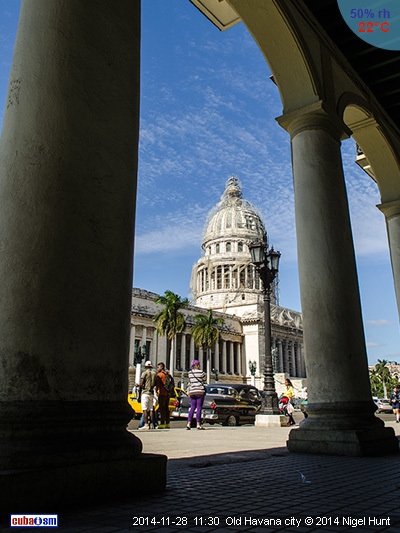 HAVANA CITY. Warm (Feels like 32C) with long sunny spells and light to moderate winds. 2014-11-22 19:00 WEATHER ACTUAL. 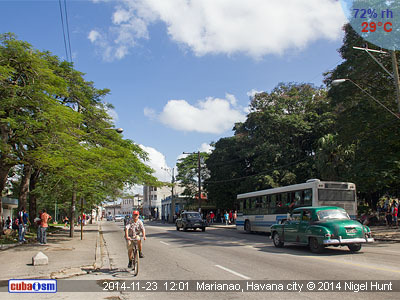 HAVANA CITY. 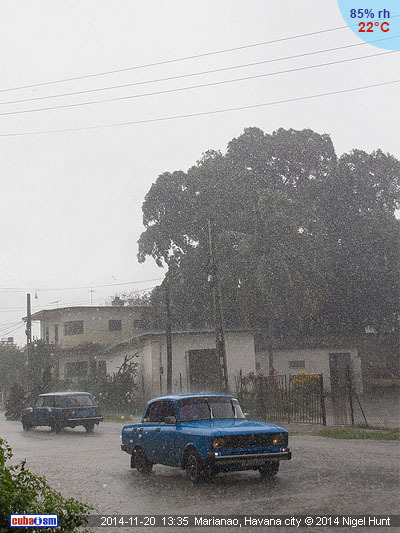 Heavy rain with occasional thunderstorms. Temperature around 25C. 2014-11-22 17:00 WEATHER ACTUAL. 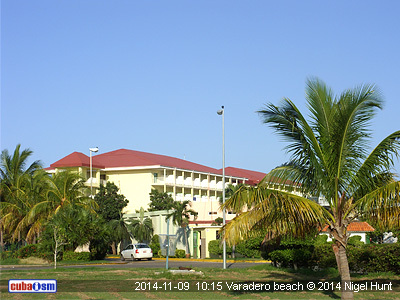 VARADERO BEACH. Mostly sunny and warm all day long. Moderate breeze and some waves along the peninsula. 2014-11-22 03:00 WEATHER FORECAST. NATIONWIDE. 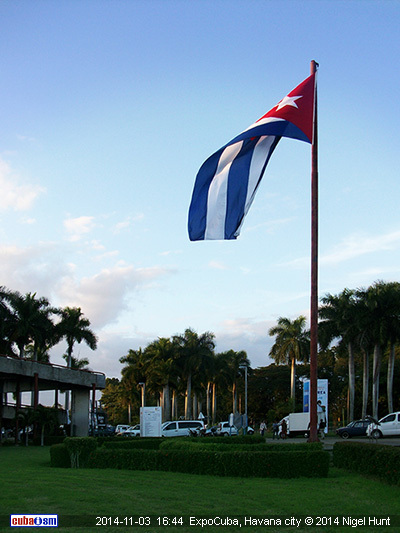 Cuba is under the influence of a large high pressure system that imposes good weather conditions across central and eastern regions. Sunny spells and occasional showers are expected in the West due to the remnants of a cold front extended over the Straits of Florida. Maximum temperature will be between 29-32C (84-90F) while overnight the lows will be around 23C (73F). The winds will blow from the East with moderately strong speed causing rough sea in the North. 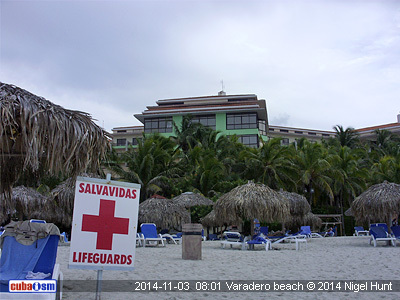 In the South, the sea will be relatively calm although minor waves are possible on the strip between Punta de Maisi and Cabo Cruz. 2014-11-21 23:00 WEATHER ACTUAL. HAVANA CITY. Mostly clear and fine with a low of 25C. 2014-11-21 17:00 WEATHER ACTUAL. 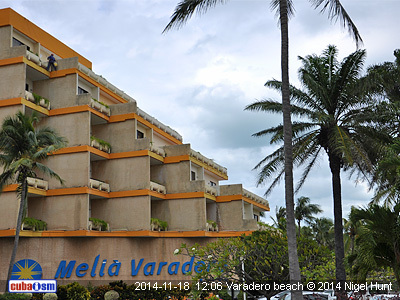 VARADERO BEACH. Sunny spells all day with occasional afternoon showers. 2014-11-21 09:00 WEATHER ACTUAL. 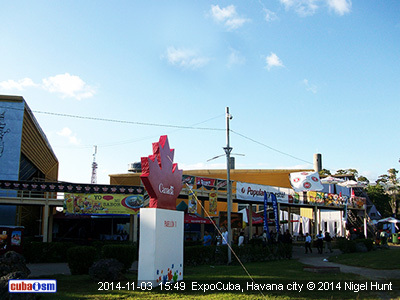 HAVANA CITY. Cloudy and damp with a high of 25C. ESE winds at 20kmph. 2014-11-21 03:00 WEATHER FORECAST. NATIONWIDE. Gradually becoming less unsettled in the West although scattered showers are still likely. 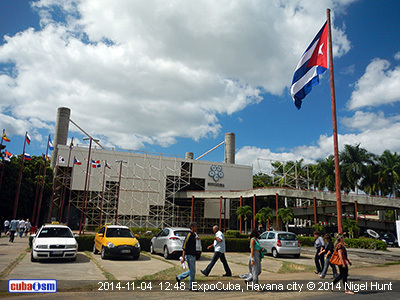 The central and eastern Cuba, however, will be mostly dry and fine. The daytime temperatures will be in the range of 28-31C (83-88F), less warm in the Western region. Later on, into the night, the lows will be between 20-23C (68-73F). There will be rough seas in the north coast, especially in the west where the force of the winds will cause dangerous waves for water activities. In the south, the sea will remain mostly quiet. 2014-11-20 20:00 WEATHER ACTUAL. 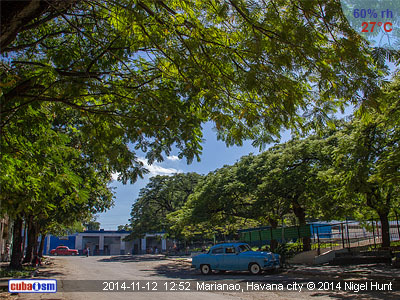 HAVANA CITY. 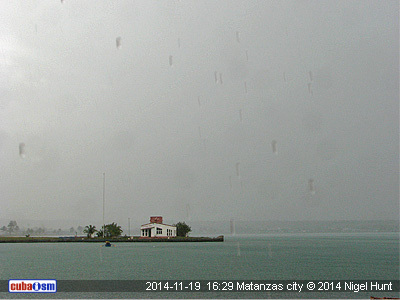 Persistent and heavy rain over the city. Low of 22C. 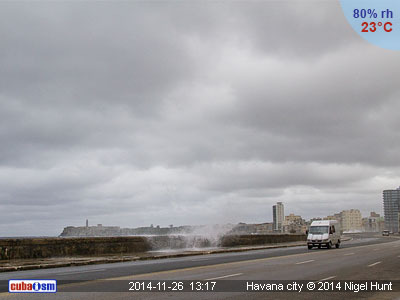 2014-11-20 17:00 WEATHER ACTUAL. 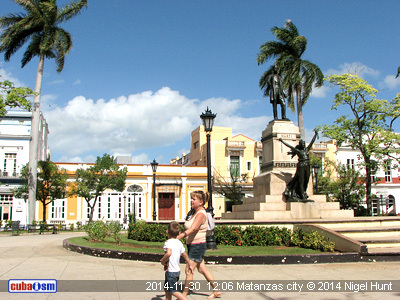 MATANZAS CITY. 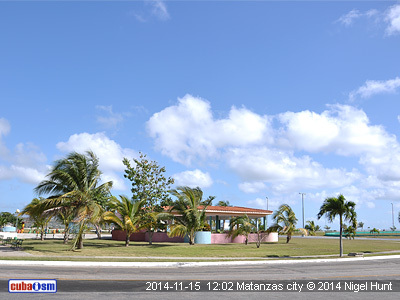 2014-11-20 14:00 WEATHER ACTUAL. 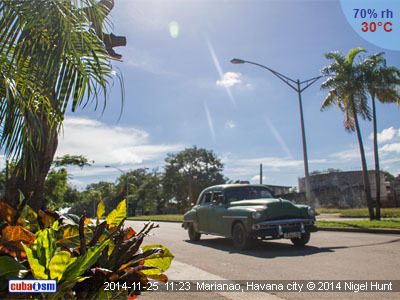 HAVANA CITY. 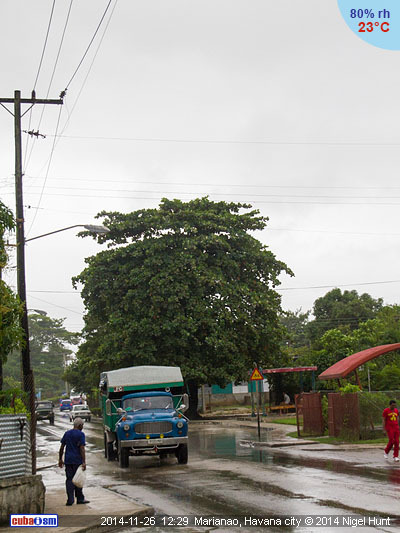 Spells of heavy rain accompanied with gusty winds. Highs of 24C. 2014-11-20 03:00 WEATHER FORECAST. NATIONWIDE. 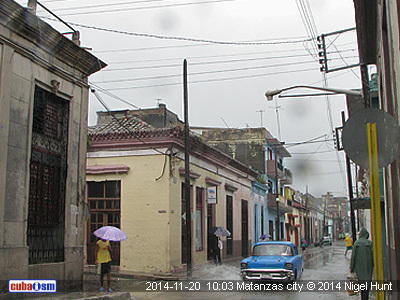 In Western and Central Cuba we will have another day of bad weather with showers straight from the outset. The showers could be particularly strong over the western provinces. The East will stay mostly dry with warm sunshine and mostly clear skies. The top temperature will be in the range of 28-31C (82-84F), although will be less warm in the West. Overnight, the thermometers will mark minimums between 21-24C (70-75F). Strong winds will produce rough seas along the north coast, especially in the West where the waves will be hazardous for fishermen and swimmers. Minor waves are possible in the South-east while in the rest of the South coast the sea will be fine. 2014-11-19 23:00 WEATHER ACTUAL. 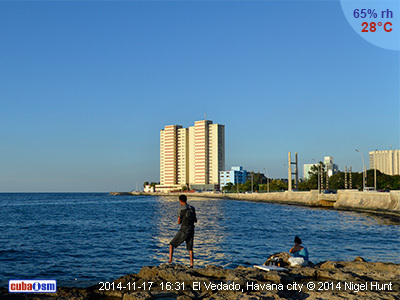 HAVANA CITY. Cool and rainy evening. Gusty winds from the North. 2014-11-19 17:00 WEATHER ACTUAL. 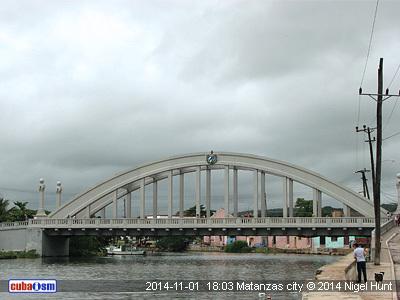 MATANZAS CITY. Cloudy skies with spells of intense rain. Warm temperatures but not too hot. 2014-11-19 03:00 WEATHER FORECAST. NATIONWIDE. 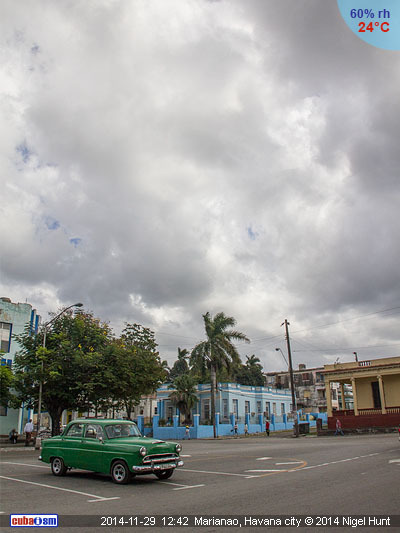 The Eastern Cuba will see a mostly sunny day with barely any clouds, unlike Western and Central regions where the clouds and rain will be the story. The highs will be between 27-30C (81-86F), 23-26C (74-79F) in the West, while the lows overnight will range from 17-20C (63-68F). The force of the winds will cause dangerous waves in the North-west, even with slight coastal flooding in low lying areas. There will be waves in the rest of the North coast while in the South the sea will remain calm. 2014-11-18 23:00 WEATHER ACTUAL. 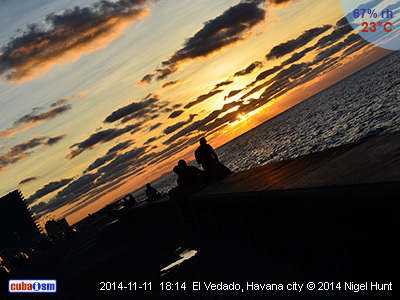 HAVANA CITY. Unsettled and showery. Gusty winds. 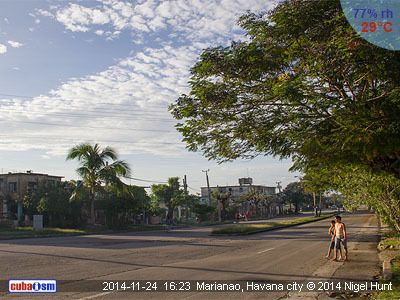 2014-11-18 17:00 WEATHER ACTUAL. 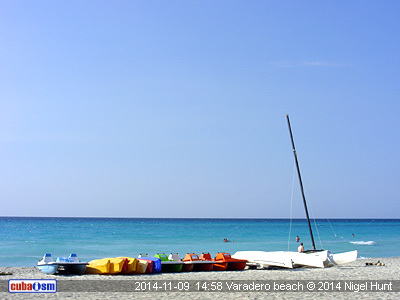 VARADERO BEACH. 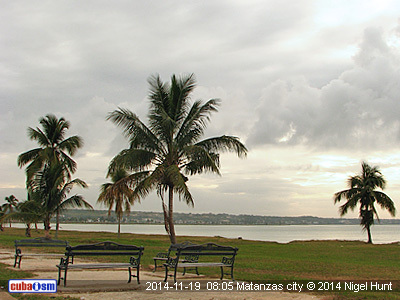 Mostly sunny morning followed by overcast weather conditions with light rain and moderately strong winds. 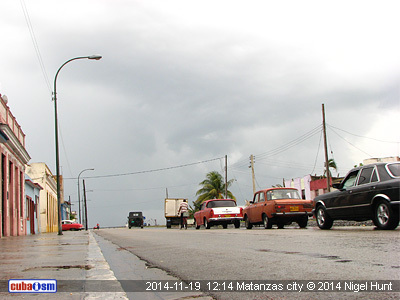 2014-11-18 12:00 WEATHER ACTUAL. 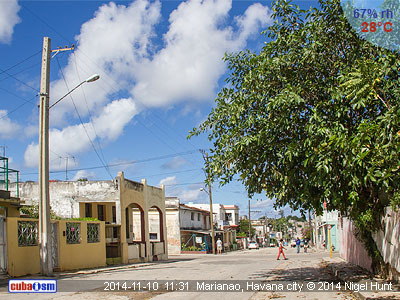 HAVANA CITY. Cloudy with a high of 27C (RealFeel 32C). SW winds at 11kmph. 2014-11-18 03:00 WEATHER FORECAST. NATIONWIDE. After a few days of warm, sunny weather, a new cold front will approach from the North-west bringing increasing clouds and a chance of rain across Western and central provinces. In East, however, the weather will be fine with sunny skies and low rain probabilities. The average temperature will be between 30-33C (86-91F), less warmer in the West. Overnight the temperature will be between 23-26C (66-72F), somewhat cooler in the West. The sea will be mostly calm across the majority of the island, apart from the North-western part where fairly strong winds will produce dangerous waves to water activities. 2014-11-17 23:00 WEATHER ACTUAL. 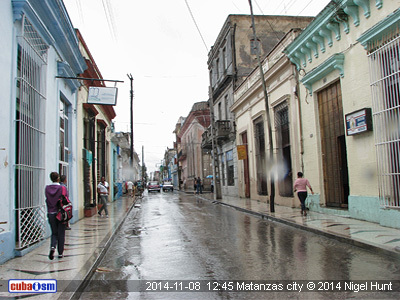 HAVANA CITY. Partly cloudy with a low of 27C. No winds. 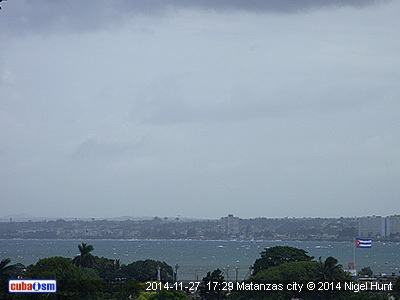 2014-11-17 17:00 WEATHER ACTUAL. 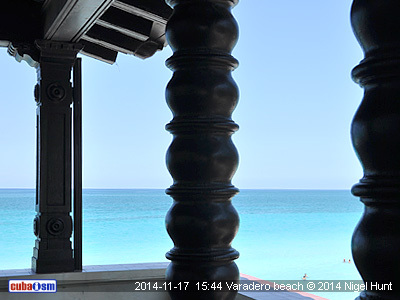 VARADERO BEACH. Clear blue skies and sunny all day. 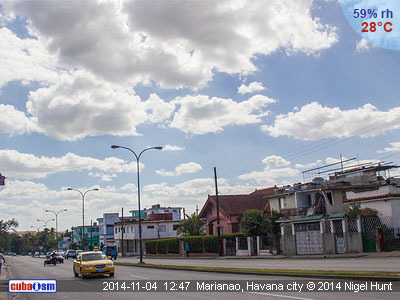 Highs in the top 20's C.
2014-11-17 12:00 WEATHER ACTUAL. 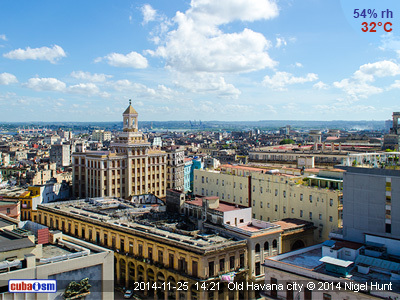 HAVANA CITY. Mostly sunny with a high of 30C (Feels like 34C). Light southern winds. 2014-11-17 03:00 WEATHER FORECAST. NATIONWIDE. 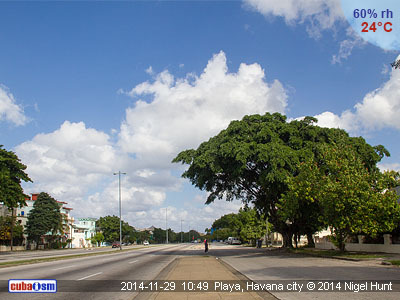 The dry weather will remain over Cuba as an outcome of the high pressure activity. 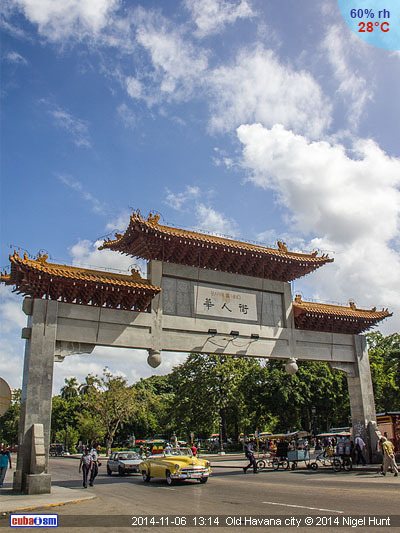 This will result in mostly clear and sunny sky with temperature ranging 29-32C (84-90F). Later, into the night, the temperature will drop to 22-25C (72-77F). Fishermen and swimmers should exercise caution due to rough sea conditions in the North-east. In the rest of the archipelago, however, the sea will be quiet. 2014-11-16 20:00 WEATHER ACTUAL. 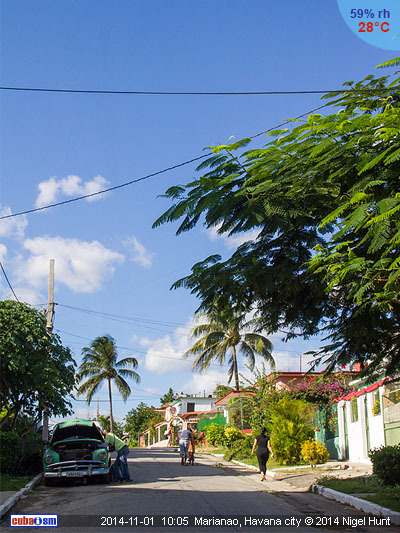 HAVANA CITY. Damp with partly cloudy skies and temperatures in the mid 20's C. Weak winds. 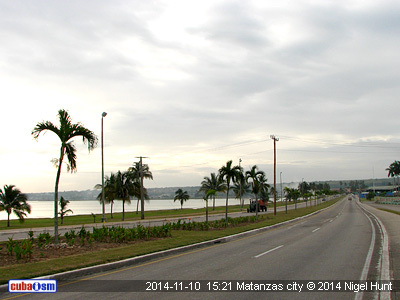 2014-11-16 17:00 WEATHER ACTUAL. 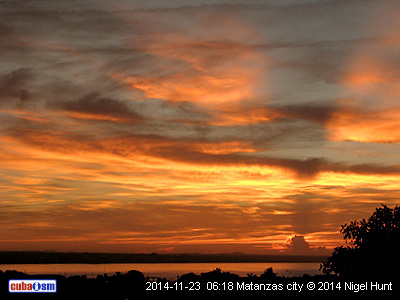 MATANZAS CITY. Warm day with lots of sunshine and clear skies; just some isolated clouds in the afternoon. A slight breeze and calm sea. 2014-11-16 03:00 WEATHER FORECAST. NATIONWIDE. 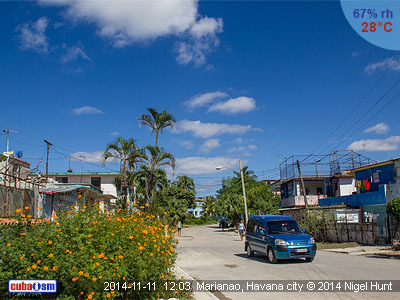 High pressure will provide continued dry weather throughout Cuba with warm sunshine and generally light winds. Maximum temperature will stay around 30C (86F) whereas at night it will be between 21-24C (70-75F). There will be waves in the North coast while in the South the sea will remain mostly calm. 2014-11-15 23:00 WEATHER ACTUAL. 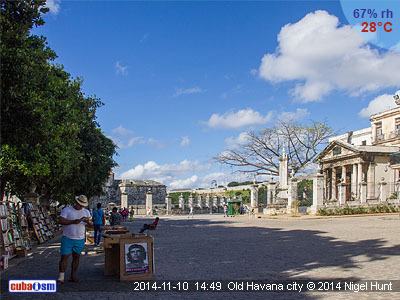 HAVANA CITY. Mostly cloudy with occasional drizzle. Lows of 26C. 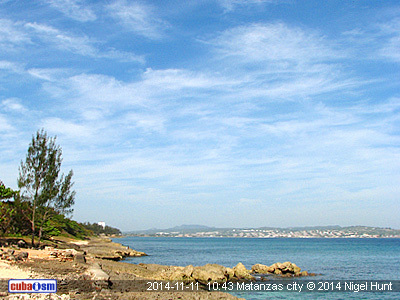 2014-11-15 17:00 WEATHER ACTUAL. 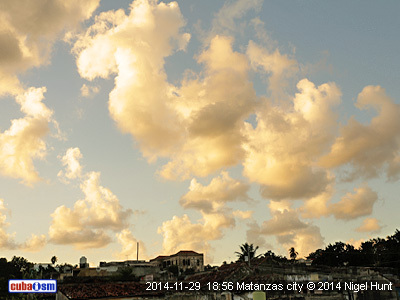 MATANZAS CITY. Mostly clear skies with plenty of sunshine and warm temperatures (28C). 2014-11-15 03:00 WEATHER FORECAST. NATIONWIDE. 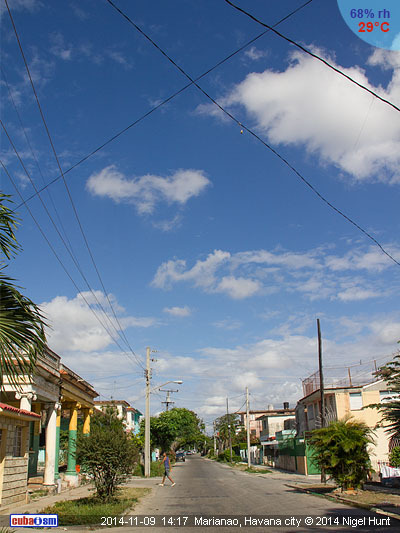 A dry day is expected today throughout Cuba with lengthy sunny spells. Although there will be a few showers in areas of the north, they won't be noticeable. Daytime temperature will be in the range of 27-30C (80-86F), somewhat hotter in the South-east. Overnight, the lows will be around 20C (68F). There will be waves in the North-west part while in the rest of the country the sea will remain fine. The winds will be moderately strong, with top speed around 35kmph (20mph). 2014-11-14 23:00 WEATHER ACTUAL. 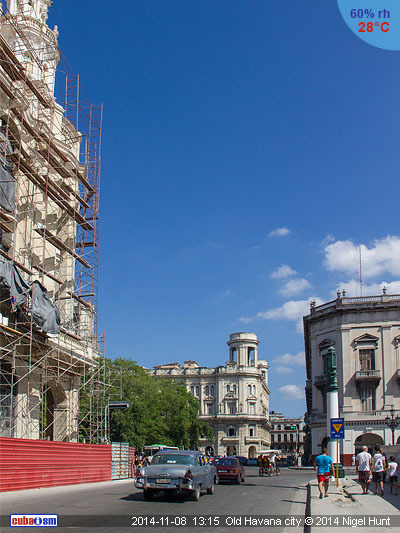 HAVANA CITY. Partly cloudy with a low around 24C. Light to moderate winds. 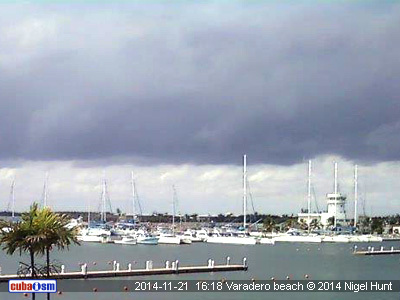 2014-11-14 17:00 WEATHER ACTUAL. 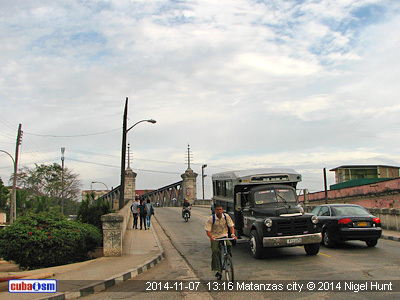 MATANZAS CITY. Sunny spells all day long with scattered showers. Warm. 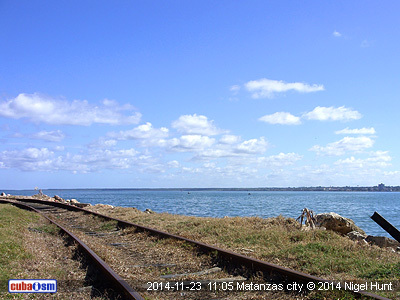 2014-11-14 12:00 WEATHER ACTUAL. HAVANA CITY. Partly sunny with a high of 27C. NNE Winds at 20kmph. 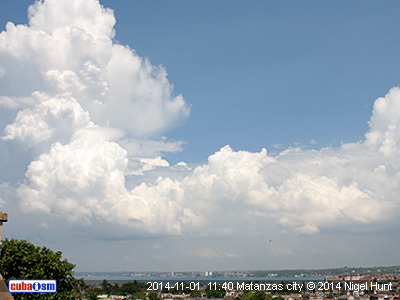 2014-11-14 03:00 WEATHER FORECAST. NATIONWIDE. 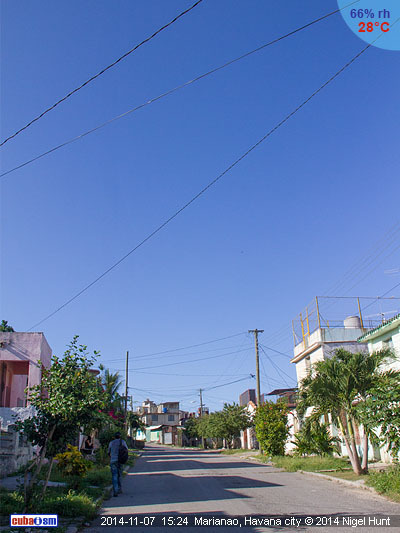 It will be a fine day throughout Cuba with bright sunny skies and highs in the top 20's C (70's F). Morning clouds and scattered rain could be present in the West but will disperse soon after. Tonight's temperature will be between 21-24C (70-75F). The winds will be weak, never exceeding the speed of 25kmph (15mph). 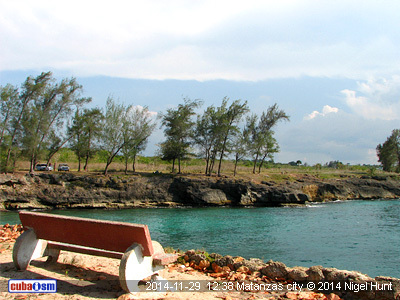 The sea will be predominantly calm in the whole archipelago. 2014-11-13 23:00 WEATHER ACTUAL. 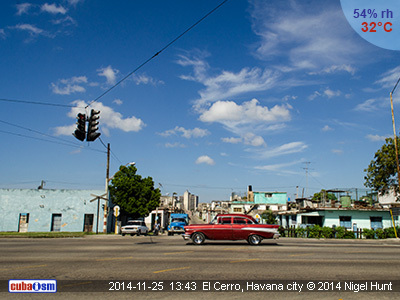 HAVANA CITY. Cool evening under mostly clear skies. Light winds. 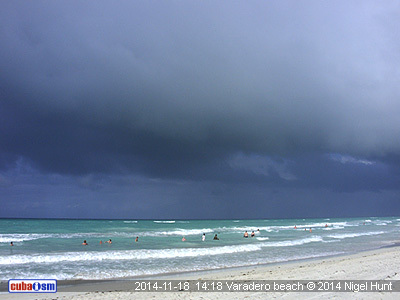 2014-11-13 17:00 WEATHER ACTUAL. 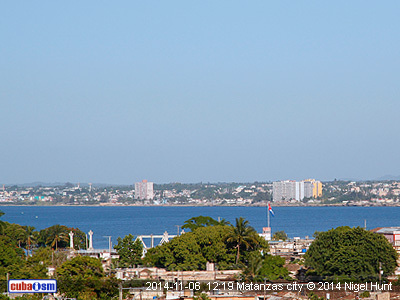 MATANZAS CITY. Dawn with a dense fog in the south. Overcast morning, not so in the afternoon and evening. Weak winds throughout the day. Warm temperatures, not too hot. 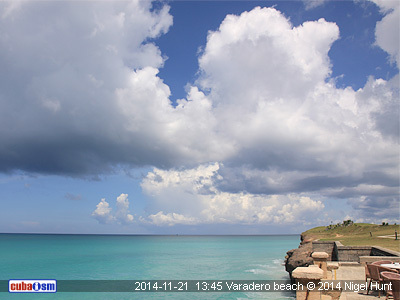 2014-11-13 12:00 WEATHER ACTUAL. 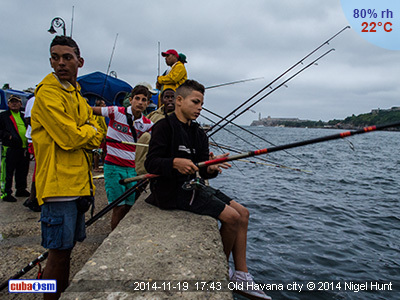 HAVANA CITY. Nice weather with sunshine aplenty and a high of 32C (not too hot in the shade). 2014-11-13 03:00 WEATHER FORECAST. NATIONWIDE. 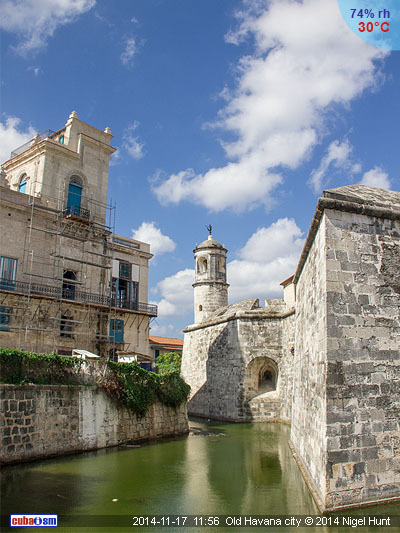 High pressure will preserve favourable weather conditions over Cuba, bringing a sunny and dry day with highs in the range of 26-29C (79-84F). Later on, into the night, the temperature will be in the low 20's C(70's F).
. The winds will be generally light and the sea will remain quiet. 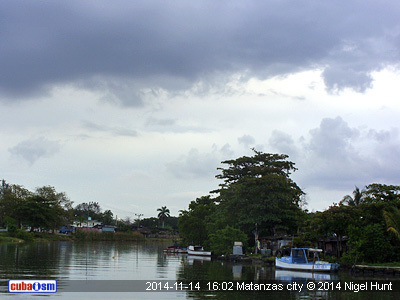 2014-11-12 17:00 WEATHER ACTUAL. 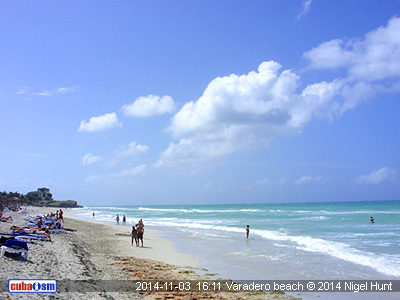 VARADERO BEACH. Warm and sunny all day. Light winds and calm sea. 2014-11-12 12:00 WEATHER ACTUAL. 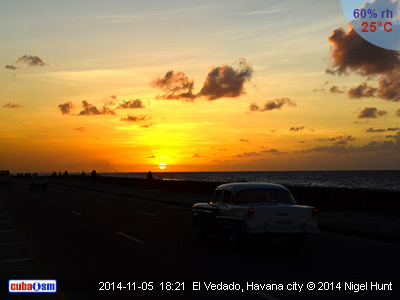 HAVANA CITY. Sunny with warm air temperatures, feeling like 28C. Light winds. 2014-11-12 03:00 WEATHER FORECAST. NATIONWIDE. 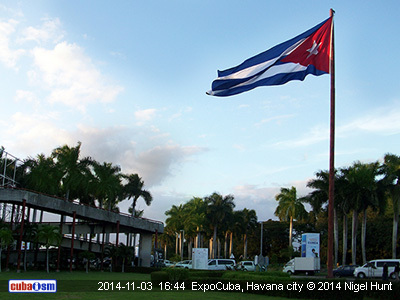 A sunny and dry weather is today's forecast for the Cuban archipelago. Slightly overcast skies and patchy rain are expected in the South-east but not enough to spoil one's day. 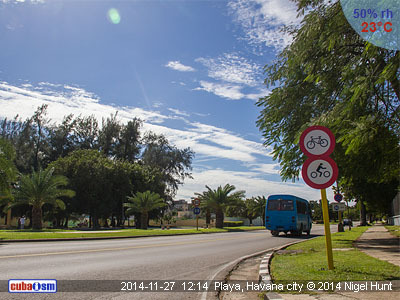 The temperature will gradually rise towards the afternoon and reach its high around 29 C (84 F). 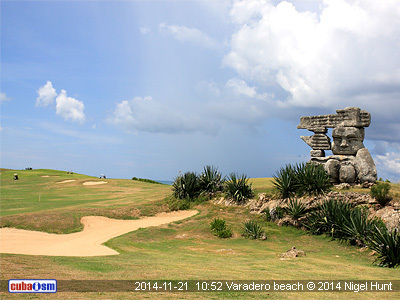 Evening comes, the temperature will drop to 17-20C (63-68F). The winds will be weak so expect a quite calm day at the beaches. 2014-11-11 23:00 WEATHER ACTUAL. 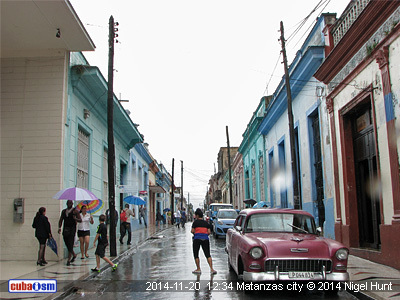 HAVANA CITY. Cool evening with mostly clear skies. Low humidity levels. 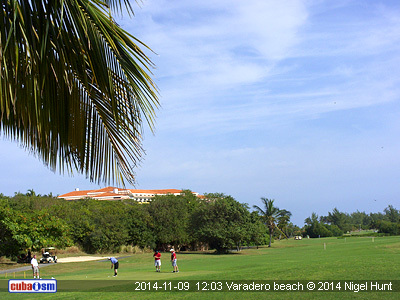 2014-11-11 17:00 WEATHER ACTUAL. 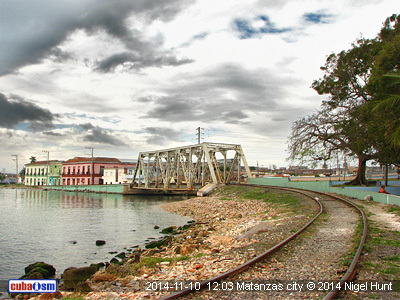 MATANZAS CITY. Long sunny spells with temperatures around 28C. Light breeze. 2014-11-11 12:00 WEATHER ACTUAL. 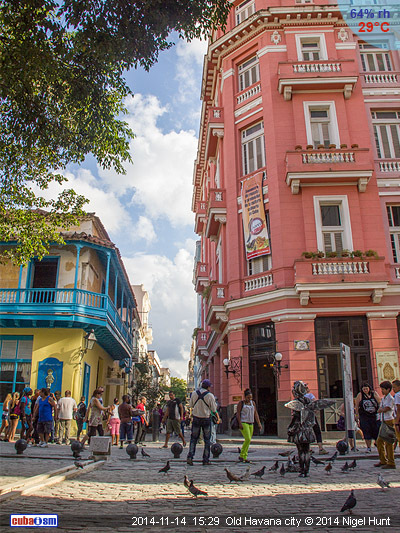 HAVANA CITY. Mainly dry and sunny with a high of 26C. Very weak winds. 2014-11-11 03:00 WEATHER FORECAST. NATIONWIDE. Expect a dry Tuesday with sunshine aplenty and variable clouds. Patchy rain is expected in the East but will be short-term and won't spoil anyone's day. Maximum temperature will be in the range of 25-28C (77-82F), somewhat warmer in the south-east. At night, the lows will be about 18-21C (64-70F). The winds will not exceed the speed of 25kmph (15mph). Expect calm sea throughout the whole archipelago. 2014-11-10 23:00 WEATHER ACTUAL. 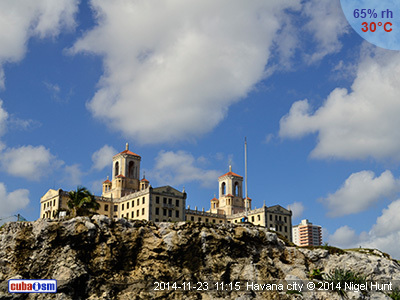 HAVANA CITY. Partly cloudy and fine with a low of 24C. 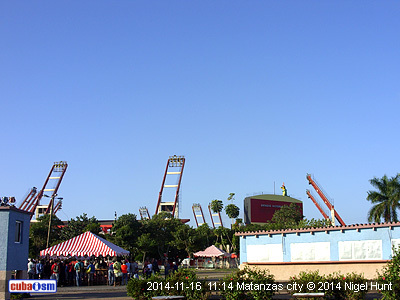 2014-11-10 17:00 WEATHER ACTUAL. 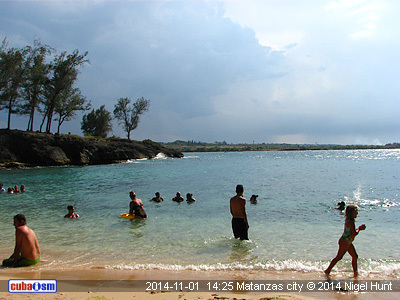 MATANZAS CITY. Cloudy with occasional sunny breaks. Light winds and temperatures around 28C. 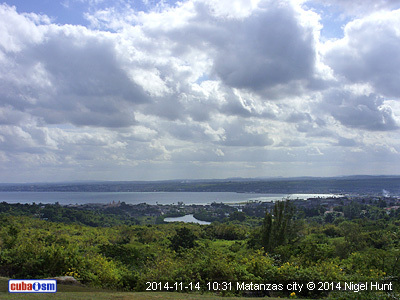 2014-11-10 12:00 WEATHER ACTUAL. HAVANA CITY. Mostly sunny with a high of 28C. NNE winds at 15kmph. 2014-11-10 03:00 WEATHER FORECAST. NATIONWIDE. 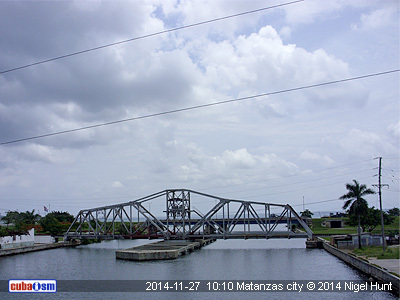 A cold front extending over Cuba determines abundant clouds with a chance of some afternoon rain. The maximum temperature will be between 29-32C (84-90F) while in the West it will be less hot. Overnight, the lows will be in the range of 19-22C (66-71F). The winds will be weak all day long. There will be waves across the North coast while in the South the sea will be calm. 2014-11-09 23:00 WEATHER ACTUAL. 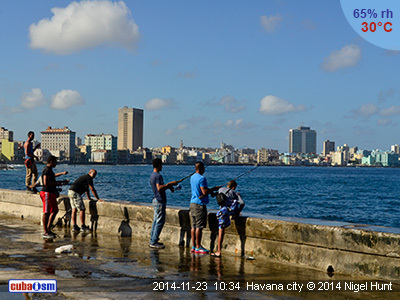 HAVANA CITY. Overcast skies with occasional drizzle. Low of 24C. 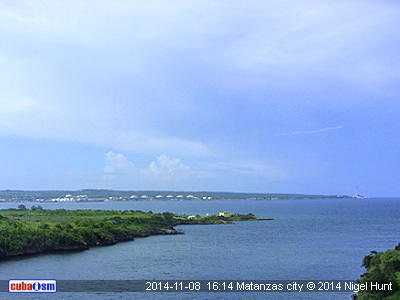 2014-11-09 17:00 WEATHER ACTUAL. 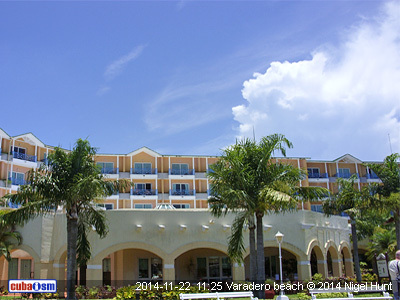 VARADERO BEACH. Sunny day with some drizzle at noon. Light breeze. 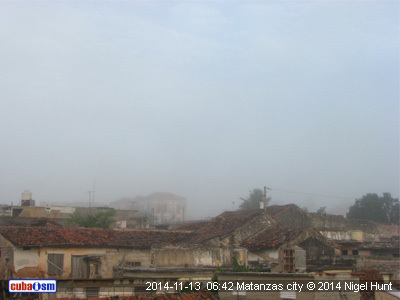 2014-11-09 10:00 WEATHER ACTUAL. 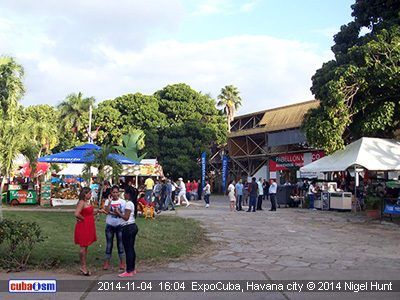 HAVANA CITY. Partly cloudy with a high of 25C. Southern winds at 24kmph. 2014-11-09 03:00 WEATHER FORECAST. NATIONWIDE. 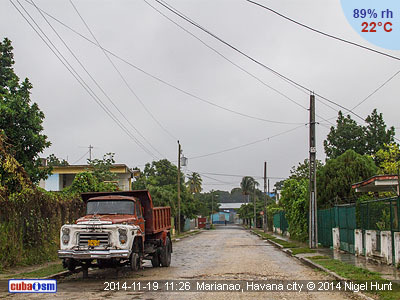 A new cold front will be passing over Cuba causing a slight change in weather conditions. 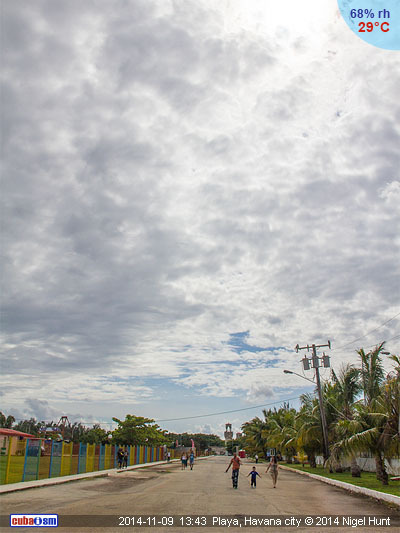 The overcast skies are expected throughout western and central regions with a chance of some rain. On the other hand, in the East, it will be fine with sunny spells and just a few afternoon showers in the North. Average temperature will be in the range of 26-29 C (79-84 F) while the lows overnight will be between 21-24C (70-75F). The winds will be blowing from the north direction with a moderate speed of 30kmph (19mph). 2014-11-08 23:00 WEATHER ACTUAL. 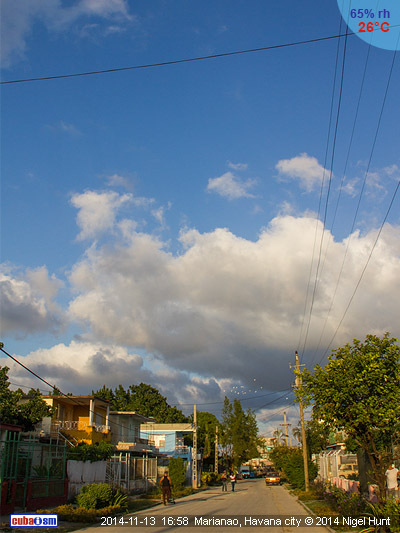 HAVANA CITY. Partly cloudy with lows around 25C. Very weak winds. 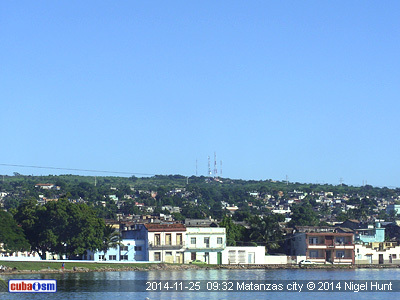 2014-11-08 17:00 WEATHER ACTUAL. 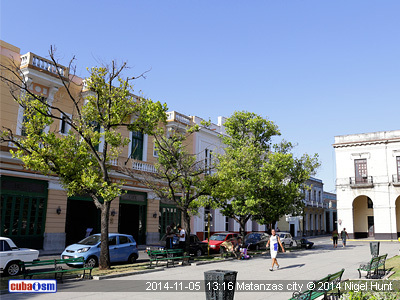 MATANZAS CITY. Warm day with plenty of sunshine and light winds. 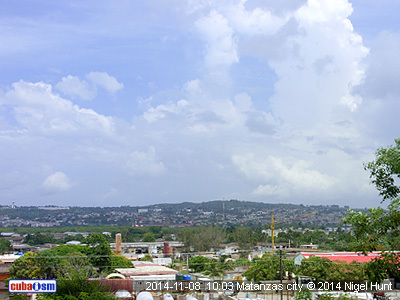 2014-11-08 12:00 WEATHER ACTUAL. HAVANA CITY. Clear blue skies, sunny and warm (Feels like 31C). SE Winds at 15kmph. 2014-11-08 03:00 WEATHER FORECAST. NATIONWIDE. Warm and sunny day ahead. 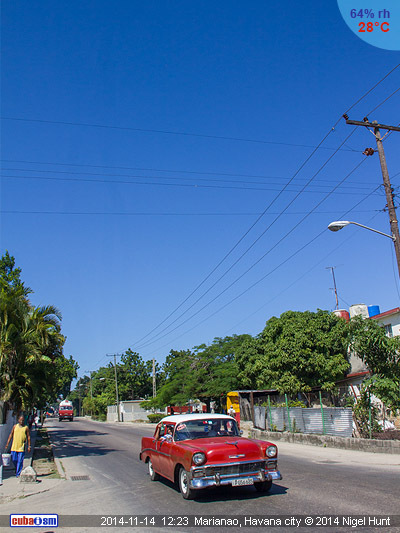 A warm and sunny day is forecast in Cuba today. It will be mainly dry throughout the country although some outbreaks of rain could occur in the North-east. Temperatures will be in the range of 29-32C (84-90F) while the minimum overnight will be in the low 20's C (70's F). 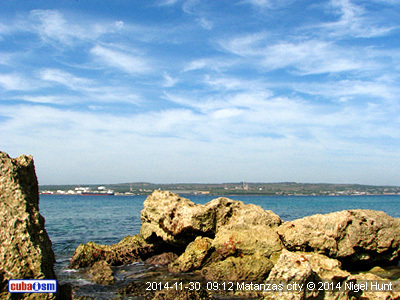 Expect a nice day with calm sea, perfect for the beach. 2014-11-07 23:00 WEATHER ACTUAL. 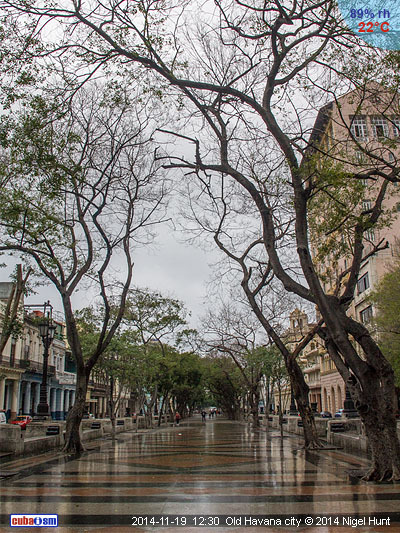 HAVANA CITY. Mostly clear and fine. Low of 23C with weak winds. 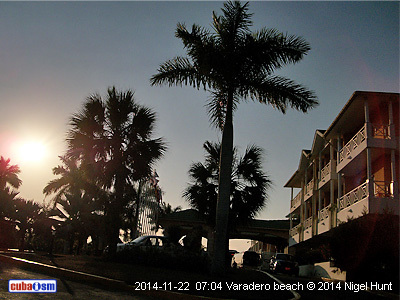 2014-11-07 17:00 WEATHER ACTUAL. 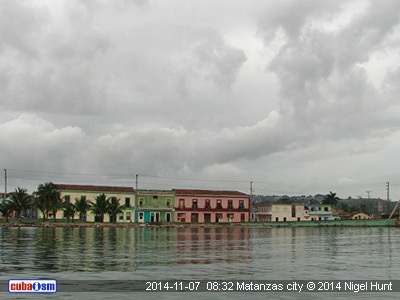 MATANZAS CITY. Sunny spells all day with scattered morning showers. 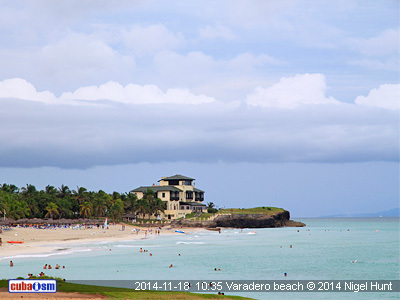 Highs in the top 20's C.
2014-11-07 12:00 WEATHER ACTUAL. 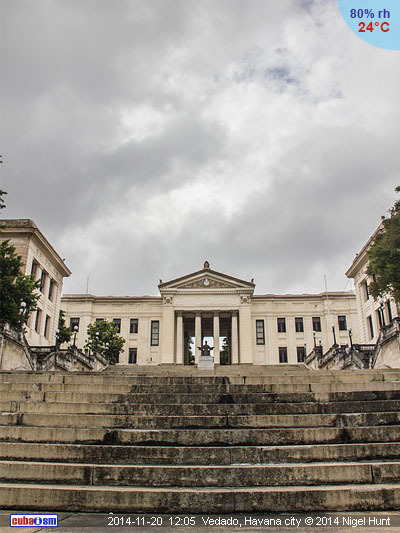 HAVANA CITY. Mostly sunny and warm (Feels like 29C). North-easterly winds at 18kmph. 2014-11-07 03:00 WEATHER FORECAST. NATIONWIDE. After a cloudy start, we will see a bright Friday with sunny spells and scattered showers in the West. In the rest of the country, however, it will be slightly overcast with some showery rain, especially in the North. Temperature will be in the range of 27-30C (81-86F) while at night it will fall into the low 20's C. The winds will be weak all day long. 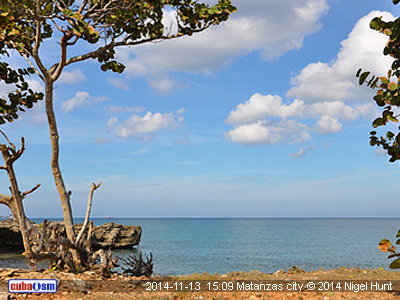 Expect calm sea across the archipelago with some waves only in the North-east. 2014-11-06 23:00 WEATHER ACTUAL. 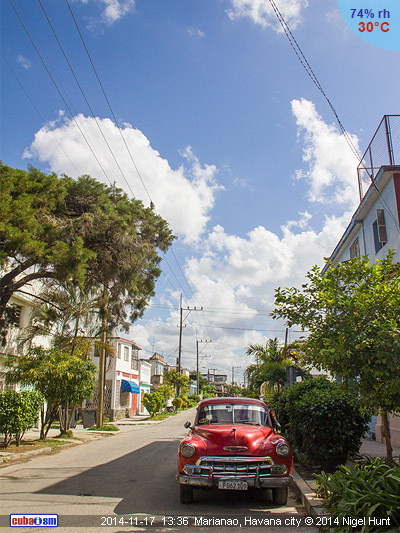 HAVANA CITY. Clear skies with a low of 24C. Weak winds. 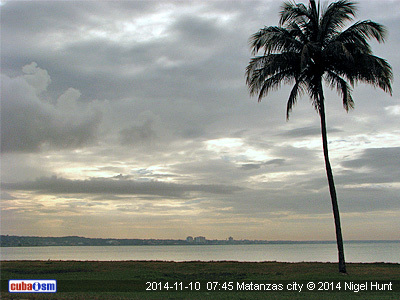 2014-11-06 17:00 WEATHER ACTUAL. 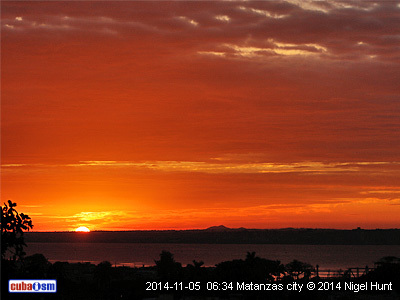 MATANZAS CITY. Sunny spells all day with warm temperatures and moderate winds. Rough sea. 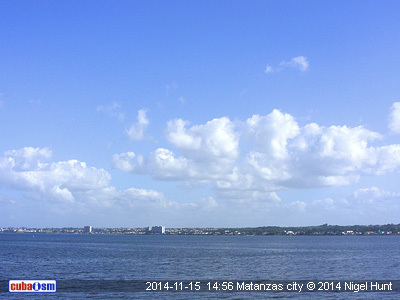 2014-11-06 12:00 WEATHER ACTUAL. HAVANA CITY. Partly sunny with a high of 28C. North-easterly winds at 15kmph. 2014-11-06 03:00 WEATHER FORECAST. NATIONWIDE. It will be a mostly dry day with long sunny spells although some showers are likely across northern parts of central and eastern regions. Daytime temperature will be in the range of 28-31C (82-84F) while at night it will be between 21-24C (57-63F). The winds won't exceed the speed of 25kmph (15mph). The waves will continue pounding the North coast, particularly in the East where the swell will represent a danger to aquatic activities. 2014-11-05 23:00 WEATHER ACTUAL. 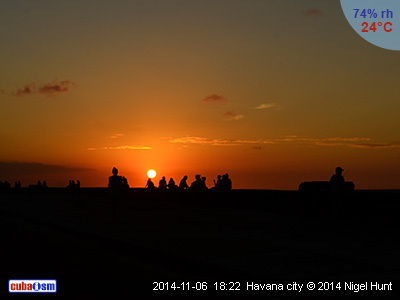 HAVANA CITY. Nice evening with clear skies and a low of 22C. Light winds. 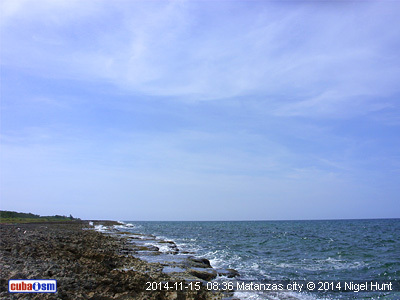 2014-11-05 17:00 WEATHER ACTUAL. 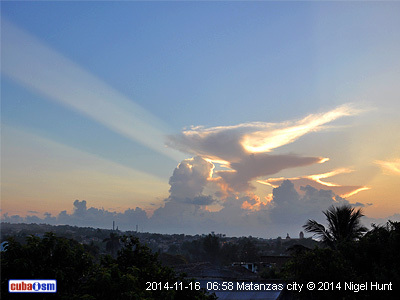 MATANZAS CITY. Mostly clear skies, sunny and warm all day. Rough sea. 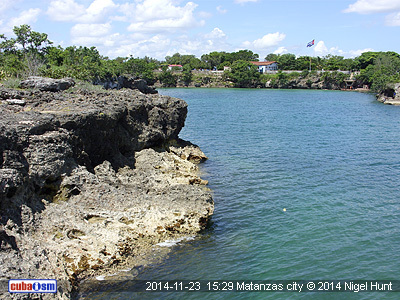 2014-11-05 12:00 WEATHER ACTUAL. 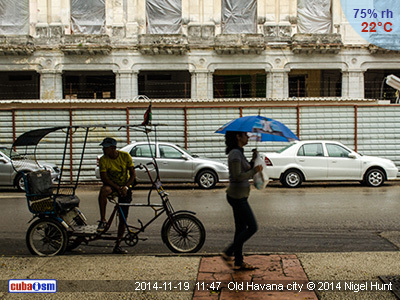 HAVANA CITY. Plenty of sunshine with a high of 29C. Easterly winds at 24kmph. 2014-11-05 03:00 WEATHER FORECAST. NATIONWIDE. 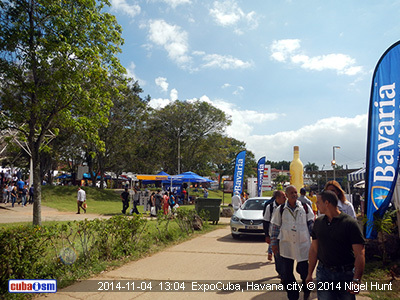 A dry and bright day is the story for most of Cuba today accompanied with lengthy warm sunny spells. There is a chance of some morning showers through northern parts but they won't spoil your day. Highs will be in the range of 28-31C (83-88F) while the evening will be less warm with temperatures in the low 20's C (70's F). Gusty winds (35kmph) will produce rough sea in the north coast and particularly in the eastern part where the waves will be an inconvenience for fishing and swimming. In the South, however, the sea will be calm. 2014-11-04 23:00 WEATHER ACTUAL. HAVANA CITY. 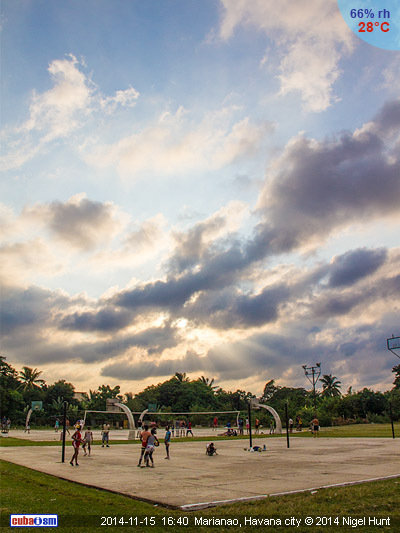 Cloudy evening with a low of 24C. Moderate winds. 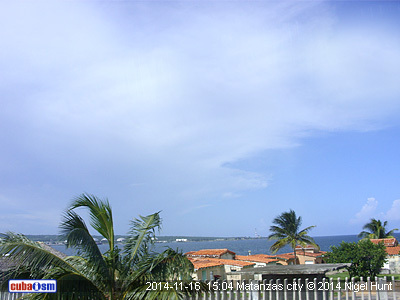 2014-11-04 17:00 WEATHER ACTUAL. 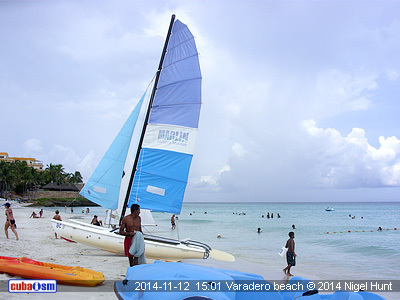 VARADERO BEACH. Sunny spells all day with some light rain in the morning. Rough sea. 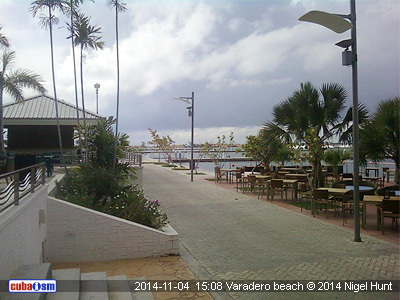 2014-11-04 12:00 WEATHER ACTUAL. 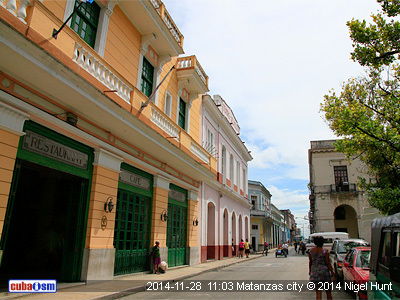 HAVANA CITY. Mostly sunny with a high of 24C. Gusty winds. 2014-11-04 03:00 WEATHER FORECAST. NATIONWIDE. 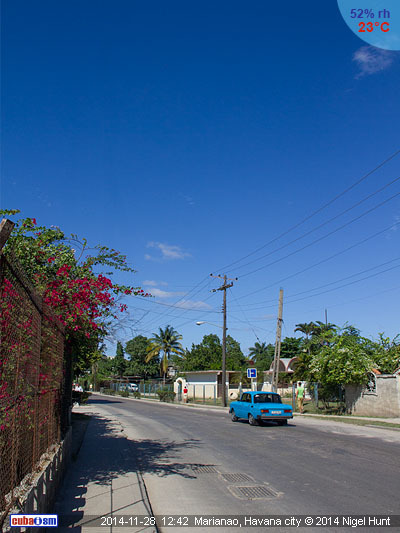 Today's Cuba weather forecast is a mainly dry day with strong sunny spells. There could be a few showers in areas of the north coast but they will be light and short-terms. Top temperatures will be between 26-29C (79-84F) while the lows tonight will be in the range of 20-23C (68-73F). Gusty winds will produce waves across the North coast; the same goes for the southern strip between Punta de Maisi and cabo Cruz. In the rest of the South coast the sea will be calm. 2014-11-03 21:00 WEATHER ACTUAL. 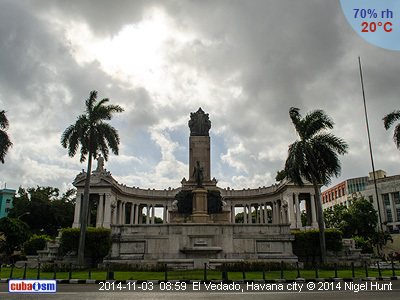 HAVANA CITY. Mostly cloudy with a low of 19C. Gusty ENE winds at speeds around 37kmph. No rain. 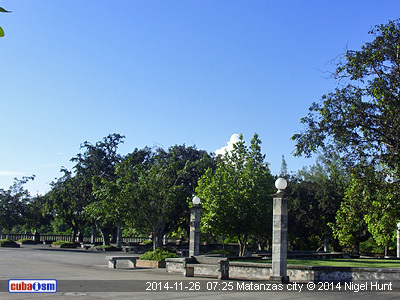 2014-11-03 17:00 WEATHER ACTUAL. 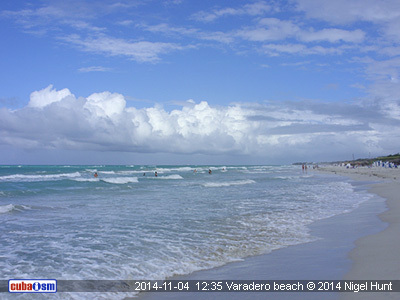 VARADERO BEACH. Fine day with sunny spells and temperatures around 25C. Rough sea. 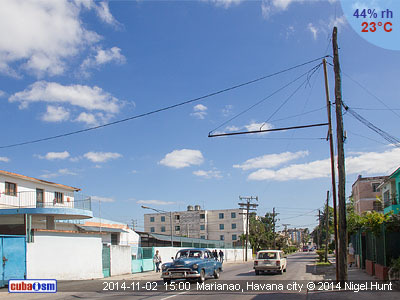 2014-11-03 12:00 WEATHER ACTUAL. 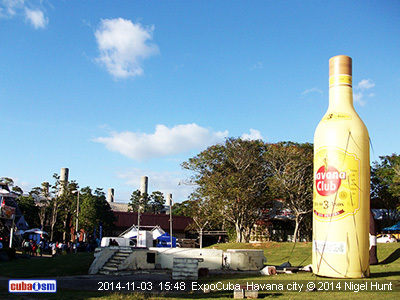 HAVANA CITY. Partly cloudy with a high of 24C. NE winds at 32kmph. 2014-11-03 03:00 WEATHER FORECAST. NATIONWIDE. Any early cloud will break up and clear, to leave another warm day with long sunny spells. Most places will stay dry, although one or two isolated showers are possible across northern parts. Maximum temperatures will be between 25-28C (77-82F), reaching 30C (86C) in the South-east. There will be a noticeable drop in temperature at night when the thermometers will mark values between 16-19C (61-66F). Gusty winds are likely in the North producing an annoying swell for fishermen and swimmers. In the rest of the country the sea will remain mostly calm. 2014-11-02 23:00 WEATHER ACTUAL. HAVANA CITY. Cool evening (20C) under clear skies. Windy. 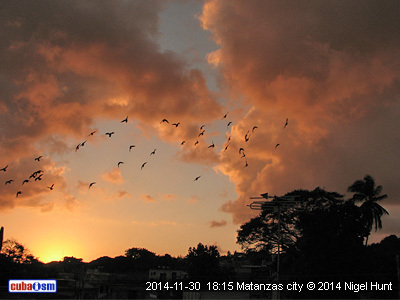 2014-11-02 18:00 WEATHER ACTUAL. 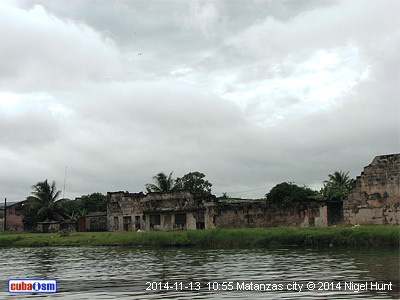 MATANZAS CITY. 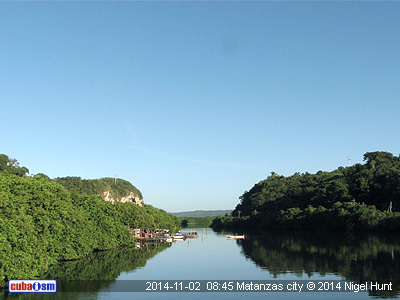 Clear skies, sunshine and light to moderate winds. Highs of 26C. 2014-11-02 12:00 WEATHER ACTUAL. HAVANA CITY. Partly sunny with a high of 23C. 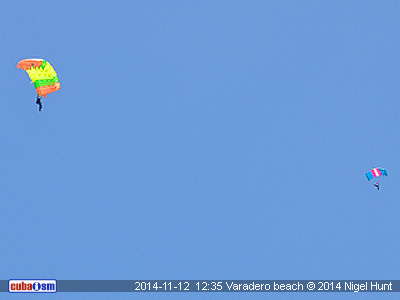 Northerly winds at 26kmph. 2014-11-02 03:00 WEATHER FORECAST. NATIONWIDE. Today will be a mainly dry day with lengthy sunny spells, although one or two showers are possible in the North-east region. The highs will be in the range of 23-26C (66-72F), 30C (86F) in the East. Overnight, the lows will be around 20C (68F). Moderate northerly winds will be predominant at speeds between 15-30kmph (6-15mph) although they can gather strenght in the North-west coast. There will be waves throughout the archipelago apart from the southern strip between Punta de Maisi and Cabo Cruz where we can expect calm sea. The waves will be bigger in the North-west causing danger for small boats and swimming. 2014-11-01 23:00 WEATHER ACTUAL. HAVANA CITY. Cool evening (22C) with mostly cloudy skies. Moderately strong winds. 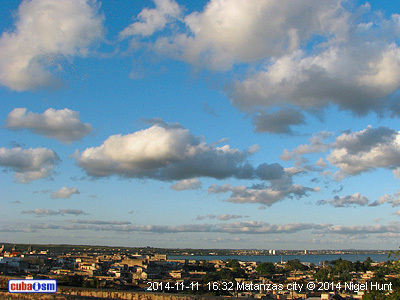 2014-11-01 18:00 WEATHER ACTUAL. 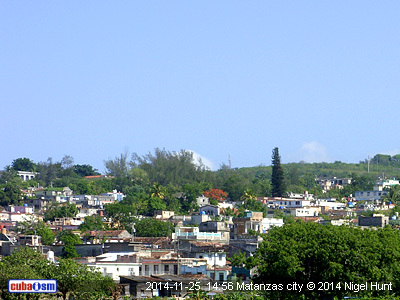 MATANZAS CITY. 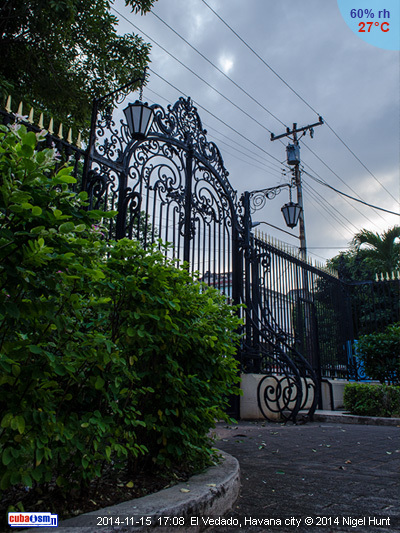 Sunny morning followed by a cloudy afternoon. 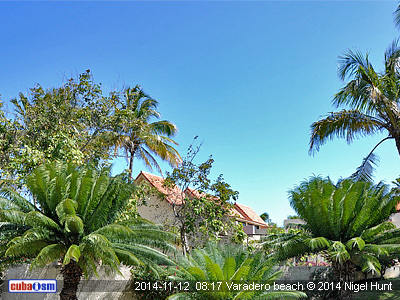 Temperatures in the top 20's C.
2014-11-01 11:00 WEATHER ACTUAL. 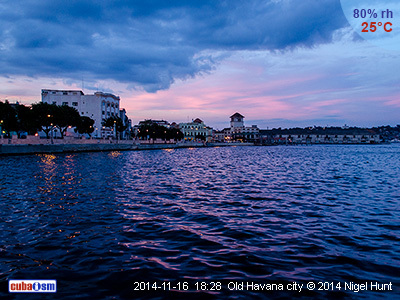 HAVANA CITY. Dry and sunny with a high of 28C. NNW winds at 15kmph. 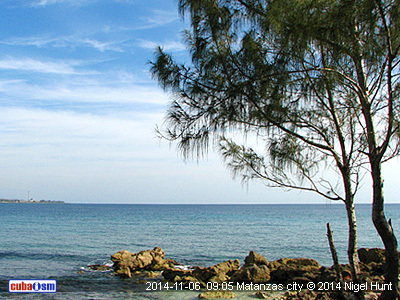 2014-11-01 03:00 WEATHER FORECAST. NATIONWIDE. This Saturday is expected to be dry and warm with long sunny spells although scattered rain showers are possible in the East. Maximum temperature will remain around 30C (86F) although you will experience a slight drop across western and central parts. Overnight, the lows will be between 21-24C (70-75F). The winds will be moderately strong with gusts of up to 35mph (22mph) across northern parts of western regions. Expect waves across the North coast while in the South the sea will be calm.